Jaime Gili’s paintings combine the austerity of geometric design with the confidence and authenticity of painterly gesture. Presented in a cluster, his paintings are often not hung, but leant against the wall, creating a temporal architecture that suggests the transience and development of urban space. 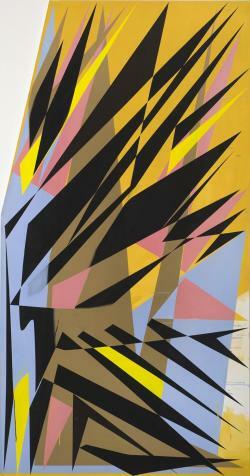 Executed in vibrant colours, Gili’s large-scale canvases capitalise on their visual power to motivate and allure. Bold splinters of pitch black, copper metallic, or tainted pink pierce through grounds animated with drips, smudges, and impassioned swipes. 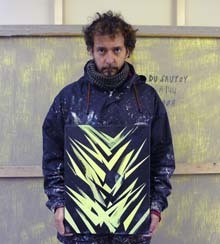 His paintings are fields of raw, potent energy. Originally from Venezuela, Gili works from a distinctly South American perspective. 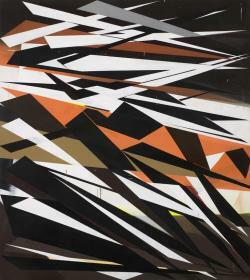 Influenced by the sharp geometric angles of 20th century architecture and the sleek elegance of classic automotive detailing, Gili’s paintings disengage the international archetypes of modernism: reflecting instead a localised adaptation of style, where design and its social implications have been internalised and customised to represent a unique national and political identity and cultural heritage. Citing his country’s rapid oil-rich economic growth and intensive South American visionary developments such as Caracas and Brasilia, Gili’s paintings address this utopian new world optimism and its inherent failure. Gili’s canvases are nostalgic for the positivism of the modernist era, where the architectural development of public space and consumer appetite for mechanical goods aroused and affirmed a sense of social buoyancy and community. 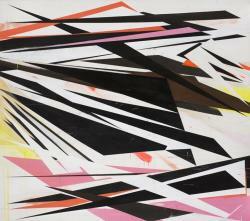 Gili’s paintings are inspired by the Constructivists’ ideas of bridging art and technology and his shard-like compositions are reminiscent of early 20th century Russian artists such as Ljubov Popova and Mikhail Larionov; his works also pay homage to great South American abstractionists such as Carlos Cruz-Diez, Jesus Rafael Soto and Alejandro Otero.